In order to promote student retention, MU’s youth programming includes mural art workshops that expose students to professions related to the arts. These first forays into the realm of mural arts allow kids to discover the history of murals and to be guided through an artistic experience culminating in a collective work of art. Through these programs, the participants come to appreciate the visual arts as a unique and significant means of self-expression while discovering arts-related trades, meeting diverse artists and acquiring related skills. 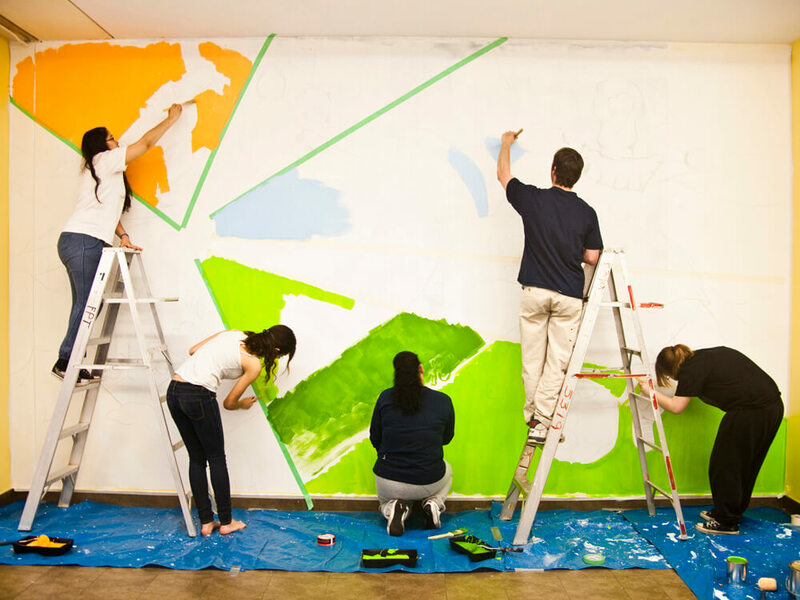 Initiated by MU in 2010 in partnership with the Commission scolaire de Montréal, Laisse ta trace/Leave a Mark is a four-month mural arts program offered to secondary V students as a weekly extracurricular activity, just like a yearbook or grad committee. In the short term, the program gives the graduates a chance to leave their mark on their high school in the form of a public art project, but more importantly, through interactions with artists and cultural workers (ex. gallery owners, graphic designers, photographers, videogame visual designer, illustrator, etc. ), it allows them to discover arts-related trades that are often undervalued and marginalized. MU offers mural arts workshops based on the specific needs of elementary and secondary schools. These workshops are both hands-on and theoretical and can lead to the production of a collective mural on panels or directly on the walls of a school. A combination of techniques and media are possible, such as stenciling, grid drawing, cutting and laying of mosaic tiles, etc. By taking part in the conceptual and creative processes, either individually or collectively, students acquire different skills and are encouraged to reflect on the social relevance of public art and their own appreciation of the visual arts. Prior to experimenting and creating, we cover a history of murals spanning from the wall paintings of the Lascaux caves to modern-day tags in order to fuel discussions on graffiti and public art. MU will provide all necessary materials. Workshops are offered at a cost of $325 per workshop (excluding cost of materials and transportation). MU is registered in the provincial directory for the Culture in the Schools program which makes financial assistance available to school administrators and teachers to support the organization of arts and culture projects at school. As part of each of its mural projects, MU partners with a local youth organization to offer a series of mural arts workshops to resident kids. In addition to interacting with the mural artist, the group has the opportunity to take part in the beautification of their neighborhood by producing their own mural (interior or exterior).